Rev. John Robert Turing was born in Batavia, the capital of the Dutch East Indies (now Jakarta, Indonesia). Sources for John Robert Turing Jr.
1 Cambridge University Alumni, 1261-1900, Record for John Robert Turing, Ancestry.com (Online Database). 2 England and Wales, Civil Registration Death Index, 1837-1915, Death record for John Robert Turing, Ancestry.com (Online Database). 3 England and Wales, National Probate Calendar (Index of Wills and Administrations), 1858-1966, 1973-1995, Probate record for John Robert Turing, Ancestry.com (Online Database). 5 England Census, 1871, Hertfordshire, Watford, Dist. 13a, p. 21, Image 22 of 41, Ancestry.com (Online Census Images). 6 England, Select Births and Christenings, 1538-1975, Baptism record for son Julius Mathison Turing, Ancestry.com (Online Database). 7 England, Select Marriages, 1538-1973, Marriage record for John Robert Turing and Fanny Montague Boyd, Ancestry.com (Online Database). 8 Scotland, Select Births and Baptisms, 1564-1950, Baptism record for John Robert Turing, Ancestry.com (Online Database). 9 Burke, Sir Bernard, A Genealogical and Heraldic Dictionary of the Peerage and Baronetage of the British Empire, 30th edition, London: Harrison (1868), 1113, Google Books (Digital Library). 10 Fordyce, Alexander Dingwall, Family Record of the Name of Dingwall Fordyce, in Aberdeenshire: Showing Descent from the First Known . . ., Toronto: C. Blackett Robinson (1885), 30, 244-245, Appendix IX, Google Books (Digital Library). 11 Furness, Hannah, "Benedict Cumberbatch and Alan Turing are related, genealogists claim", The Telegraph, (accessed 06/30/2017). 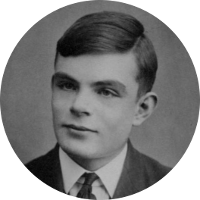 12 Wikipedia, "Alan Turing", (accessed 06/30/2017).